Inspired by starry nights, this romantic and whimsical Wedding Invitation Suite was originally designed for an al fresco summer wedding. The design features twinkling stars paired with a calligraphy-style font. 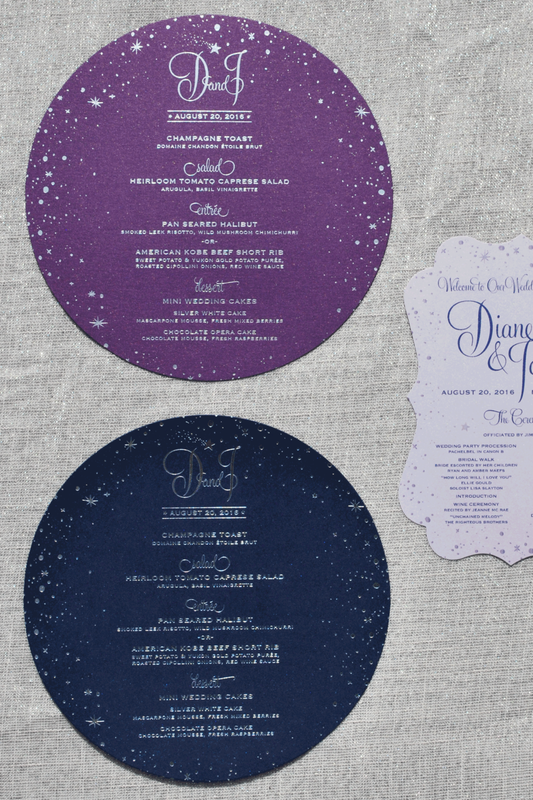 The variation shown below is shown foil printed with silver foil on midnight blue and shimmering amethyst cardstocks, paired with lavender and sparkling sapphire accents. The Invitation Suite included a foil embossed Wedding Invitation, Map Insert with a Weekend Agenda, Mini Insert with Envelope and Envelope Addressing and a sparkling Envelope Liner. The Day Of Materials included die-cut circle-shaped Dinner Menus, Victorian-shaped Ceremony Programs, Stickers, Favor Labels, Signage and more.